The Happy Cow Creamery www.happycowcreamery.com at 332 McKelvey Road Road, Pelzer, South Carolina, USA is a well known Dairy farm with a unique on the farm milk bottling operation offering high quality fresh milk directly from its own dairy cows. Owner Tom Trantham is also a director of the Rural Advancement Foundation International www.rafiusa.org , a farmer’s cooperative that that supports environmentally sound, sustainable, socially just family farms. Last Friday 14 May 2010 Tom Trantham, in the quest to use environmentally sustainable energy sources for his farm, installed two units of Microsolar high efficiency solar heaters that deliver 70C hot water for cleaning and sterilising his milking machines. Previously he was using LPG gas or electricity to heat the water, so his energy bills for hot water for milking equipment will be halved, which is a substantial savings for the average dairy farmer. The advantages of a high efficiency solar heater over gas are no maintenance or relatively no maintenance, no need for resupply of gas cylinders and no danger of explosions or gas leakage, and no air pollution. Microsolar Water Heaters are the world’s highest efficiency thermosyphon solar heaters, with passive solar efficiencies (no circulation pumps, no chemicals, no electricity) of 40.7% as tested by South Africa’s Bureau of Standards. They are of a unique patented coaxial multivalve design and are designed and assembled in Malaysia for the international market. 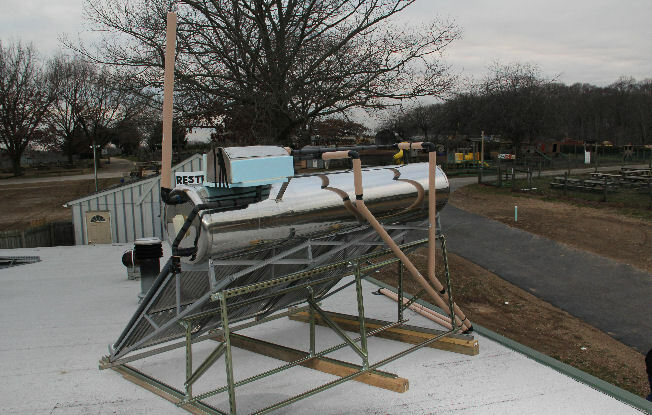 Most other solar heaters are of 30% efficiency or less. How does it work? 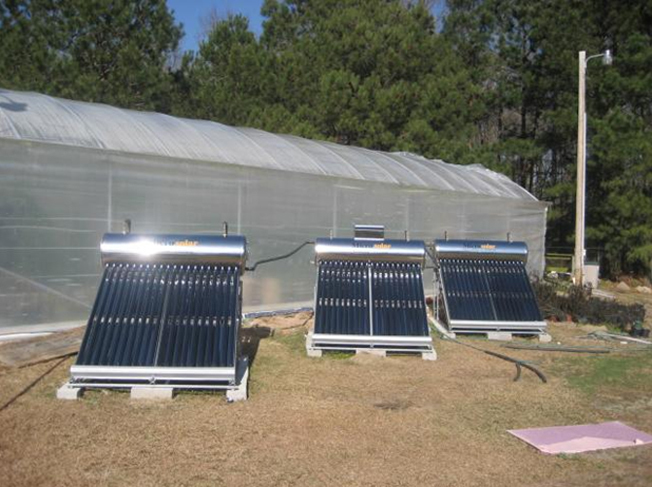 Conventional solar heaters, may possess efficient solar collector panels per se, with high solar absorption to the collector, but they unfortunately stifle hot water circulation by having only one small horizontal pipe connection only between their collector panel and tank. This requires a circulation pump to overcome the bottleneck effect of the inefficient single connection pipe and is also subject to pumping losses between the collectors and remote tank. 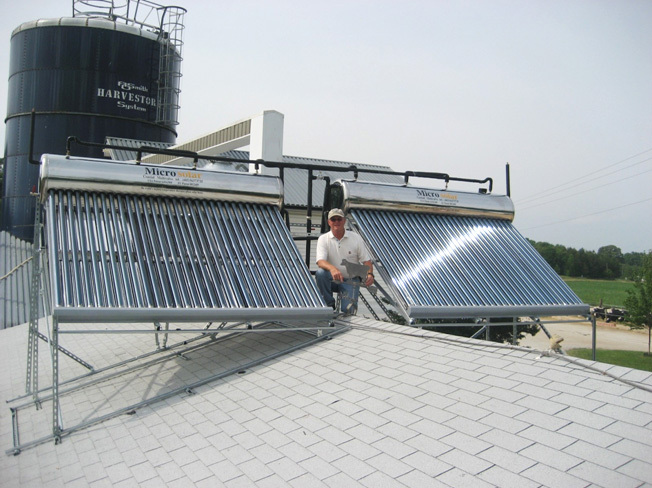 Microsolar does not stifle the natural solar convection, it has 30 large vertical heating pipes directly into the tank from the collector panel, with no bottlenecks, no pumps, no horizontal pipes between collector and tank. 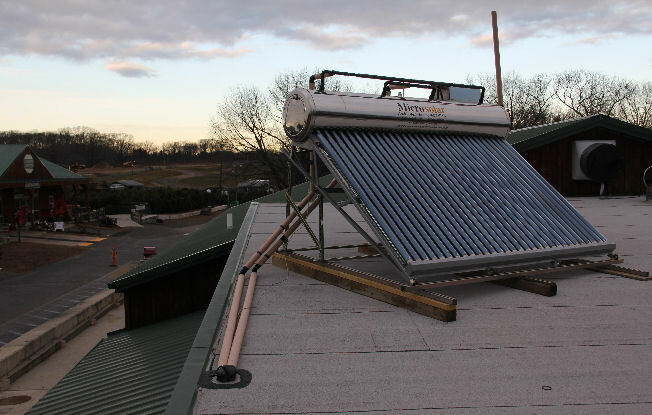 Hot water in nature rises vertically, while horizontal pipes and single pipe bottlenecks retard the free flow of rising hot water from the solar collector panel into the tank. The Microsolar comes with a pressurized indirect heating copper twin coil heat exchanger for durability and sediment resistant low maintenance, using the latest robotic tungsten argon gas welding stainless steel 304 hot water storage tanks, mirror finish 304 stainless steel concentrating parabolic reflectors, 60mm high pressure injected polyurethane foam insulation, and high temperature borosilicate evacuated glass vacuum tubes 58mm x 1800mm. Solar heated greenhouse with 3 units Microsolar M60VTHE 250 litres. 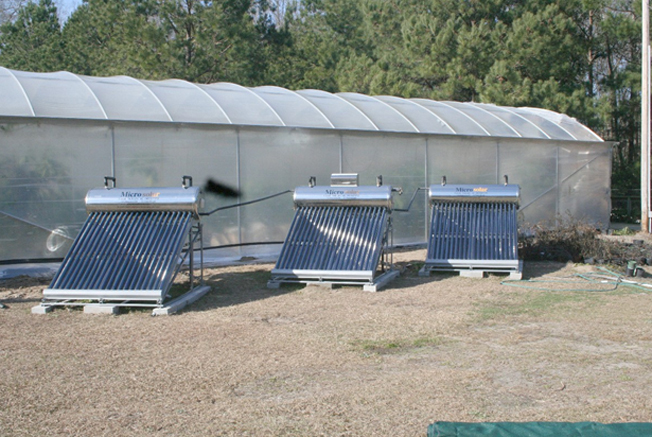 The Microsolar heated greenhouse helped protect this citrus farm in Florida, USA from the harsh frost/ snow winter of 2009/2010 when some parts of the state were covered with snow for the first time in 50 years.